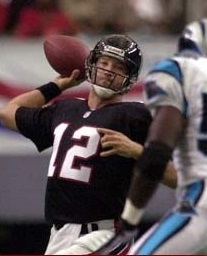 The Atlanta Falcons were in the midst of a five-game losing streak as they hosted the Carolina Panthers on October 29, 2000. Two years removed from a NFC Championship, the Falcons, coached by Dan Reeves, were coming off of a losing season in 1999 and at 2-6 thus far in 2000. QB Chris Chandler was struggling behind a poor line and RB Jamal Anderson (pictured above), highly productive in 1998, was back after missing virtually all of ’99 with a knee injury but was slow in returning to form. The Falcons had beaten Carolina in a sloppy game in the season’s third week, putting them at 2-1, but had lost every game since. The Panthers, in their second year under Head Coach George Seifert, had a 3-4 record but were coming off of two wins in their last three games and were hoping to get into the playoff hunt. There were 46,178 fans in attendance at the Georgia Dome. The Panthers had the first possession and put together a long series that covered 75 yards in 16 plays, helped along by a 26-yard pass interference penalty that converted a third-and-13 play. QB Steve Beuerlein completed four passes, two of them to WR Donald Hayes, and the longest to FB William Floyd for 15 yards. The drive finally stalled at the Atlanta 17 and Joe Nedney kicked a 35-yard field goal. The Falcons responded with a long series of their own as Jamal Anderson ran effectively and Chris Chandler also hit on four throws. Morten Andersen tied the score with a 35-yard field goal. Following a Carolina punt early in the second quarter, Chandler had a pass picked off by DT Sean Gilbert to give the Panthers the ball again at the Atlanta 39. Helped along by a Beuerlein (pictured at right) throw to WR Muhsin Muhammad for seven yards to convert a fourth down, the visitors drove to another Nedney field goal, this time from 48 yards to go up by 6-3. The Falcons had another scoring opportunity later in the period, but Andersen missed a 46-yard field goal and the score remained unchanged at halftime. Following an exchange of punts to start the third quarter, Chandler again gave up an interception, this time to SS Mike Minter who returned it eight yards to the Carolina 42. Beuerlein completed five passes, most significantly to Hayes for 19 yards and, on a third-and-19 play, to RB Tim Biakabutuka for 25 yards to the Atlanta five. The Panthers failed to reach the end zone, but they came away with a third Nedney field goal from 25 yards to extend the lead to 9-3. The next Carolina possession also resulted in three points as a roughing-the-passer penalty, a Beuerlein toss to TE Wesley Walls for 19 yards, and an unnecessary roughness infraction that wiped out a sack helped the Panthers along. Nedney’s 24-yard field goal put the visitors up by 12-3 with 12:40 to play and it appeared that the visitors had the game in hand. The Falcons instead came back with a 13-play, 80-yard drive. Chandler hit on four straight passes and seven overall along the way. Three were to WR Terance Mathis, including a nine-yard gain that converted a third-and-three situation, and two were to WR Tim Dwight, with one for 13 yards on a third-and-six play to the Carolina 19. Jamal Anderson ran for the last two yards, Morten Andersen converted, and the score was narrowed to 12-10. Atlanta got the ball right back when Beuerlein’s next pass was intercepted by CB Ray Buchanan, who returned it 13 yards to the Carolina seven. Two carries by Anderson netted a yard and Chandler was sacked by LB Hannibal Navies for a seven-yard loss, but Morten Andersen booted a 31-yard field goal and the Falcons were up by a point with the clock down to 2:57. There was still time for the Panthers, but Beuerlein fumbled when sacked by DT Ed Jasper on a second down play and DT Travis Hall recovered for Atlanta at the Carolina 21. While a holding penalty wiped out a 17-yard run for a would-be touchdown by Jamal Anderson and Morten Andersen missed on a 42-yard field goal try that hit the upright, there were just 50 seconds to play when the Panthers got the ball back. Beuerlein threw two short passes to WR Isaac Byrd, but the game ended on a desperate long pass toward the end zone that Buchanan intercepted to clinch the 13-12 win for the Falcons. In a game dominated by the defenses, Atlanta rolled up the most yards (281 to 209) while each team had 16 first downs. The Falcons did especially well on defense, holding the Panthers to just 30 rushing yards in 20 attempts and registering five sacks, to one by Carolina. The Panthers also turned the ball over four times, three in the fourth quarter, while Atlanta had three turnovers. Both teams were heavily penalized, with Carolina drawing 9 flags at a cost of 58 yards to 8 penalties for 98 yards on the Falcons. Chris Chandler (pictured at left) completed 19 of 29 passes for 191 yards with no touchdowns and two interceptions. Jamal Anderson rushed for 90 yards on 25 carries that included the game’s only TD and also had 5 catches for 15 yards. Terance Mathis led Atlanta’s receivers with 7 pass receptions for 89 yards. 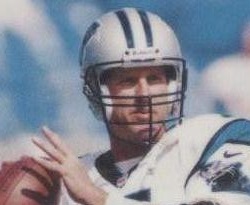 For the Panthers, Steve Beuerlein, who was heavily pressured throughout the contest, was successful on 21 of 41 throws for 202 yards and gave up three interceptions. Tim Biakabutuka led the receivers with 51 yards on four receptions as well as rushing with 23 yards on 14 attempts. Wesley Walls, who left the game with a season-ending knee injury in the third quarter, and Donald Hayes also had four catches apiece, for 47 and 41 yards, respectively. Joe Nedney was a perfect four-of-four on field goals. Unfortunately for the Falcons, the struggles continued and they didn’t win again until the season finale. 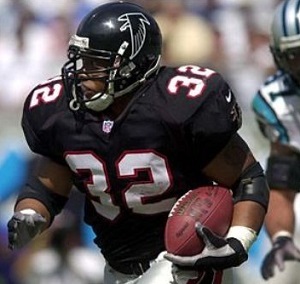 Chris Chandler continued to have difficulty in an injury-plagued season and while Jamal Anderson ended up rushing for 1024 yards, Atlanta was unable to control the ball effectively while dealing with injury problems on defense. Their 4-12 record put them in the NFC West’s basement. Carolina won the next week but remained an inconsistent team that placed third in the division at 7-9.